Thanks to advanced technology, today’s consumers have more choices than ever before. That’s why every touchpoint with your customers is so important – including ensuring the smooth, timely delivery of customer orders. 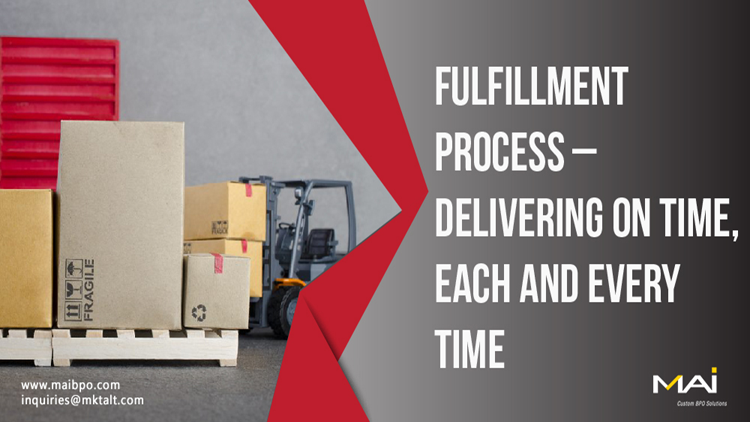 The “fulfillment process” encompasses all activities from receiving an order right through delivery of the goods to the customer. The basic expectation is that orders will be received on time and in good condition. Do this consistently and your customer’s glowing word-of-mouth testimony and positive reviews could bring in new business. Having a well-defined fulfillment process will help you achieve this goal. The overall fulfillment process can be enhanced by identifying and optimizing a few critical factors. Managing demand vs supply : Businesses need to have a complete view of their stock, status of current and pending orders, seasonal demands, etc. ‘Out of stock’ is never good! Structuring the warehouse : It is important ‘how’ and ‘where’ stock/product is stored within the warehouse. Accurate control over the stocking process leads to timely order fulfillment and eventually, happy customers. Planning Logistics : It is not just limited to identifying the most effective way to get the right goods picked, packed and delivered. It also includes ensuring quickest delivery time and good condition of the product. Efficient stock management processes help facilitate quick and accurate picking. Packaging is another important feature that requires attention. Transportation can cause damage to shipments if they are not packed properly. Some goods are fragile and may need special packing. Businesses can either have their own fleet management or rely on a third party logistics partner. Regardless of how it is done, the goods must be delivered on time and in good condition as promised. 2. Use of appropriate technology/automation can save time and reduce errors. Use of appropriate technology helps in streamlining the supply chain management process. Automation saves time and reduce errors in comparison with traditional/manual processes. Modern day e-commerce demands process automation. Amazon Robotics, a unit of Amazon.com, continues to invest in research of systems that will save time in order fulfillment. 3. Efficient staff who are motivated and well-informed can add the personal touch that customers look for. Managing customer expectations : It is vital to follow-up, return customer calls and address customer inquiries in order to win and grow customer loyalty. Proper staff training reduces errors. Although errors are inevitable, how a business handles a mistake is what matters to the customer. Customers will acknowledge and appreciate that business is genuine when they are kept informed and when the business takes prompt, appropriate corrective actions when mistakes occur. The value of the personal touch. Every customer appreciates that little something extra. Allowing options for customization or making changes to the order placed helps achieve this. Premium packaging makes a difference. The way your product is delivered matters. If the products are received in good condition, it creates a positive impact among your customers. Product delivery time/schedule is maintained as promised. A broken promise in this context could turn down a loyal customer. Exceptional situations and error should be managed with the customer in a professional and efficient manner. All businesses strive to execute their orders quickly, accurately and efficiently. A perfect fulfillment process is a difficult target to achieve. However, it is possible if the above factors are made to work in a synchronized manner. It finally boils down to – if the goods are delivered on-time and in good condition to the customers.